James Reilly, a former NASA astronaut who flew on three shuttle missions and performed five spacewalks, has been nominated to be the next director of the U.S. Geological Survey. WASHINGTON – The White House announced Jan. 26 that it will nominate former NASA astronaut James Reilly to be the next director of the U.S. Geological Survey (USGS). Reilly, if confirmed, will lead an agency whose responsibilities include the Landsat series of Earth science satellites, but one that is also facing significant budget cuts from the administration. Reilly joined NASA's astronaut corps in 1994 after working for more than a decade as an oil and gas exploration geologist for Enserch Exploration Inc. He has three degrees in geosciences, including a doctorate, from the University of Texas Dallas. As an astronaut, Reilly flew on three shuttle missions that visited two space stations. His first flight was on STS-89 in January 1998, docking with the Russian space station Mir. He flew on the STS-104 mission to the International Space Station in July 2001, delivering an airlock module and performing three spacewalks. He returned to the ISS in 2007 as part of the STS-117 crew, performing two additional spacewalks. 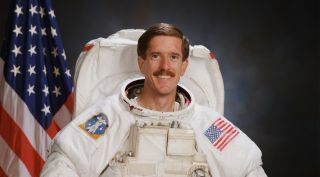 Reilly retired from the astronaut corps in 2008. He worked for several companies and started his own firm, Mach 25 Management, for consulting and speaking work. Most recently, he has been a subject matter expert on space operations for the U.S. and allied militaries, and instructor for a U.S. Air Force Space Command professional development course. He was also an officer in the U.S. Naval Reserve. Reilly would lead an agency whose responsibilities include a wide range of land and water natural resource studies, as well as natural hazards research. That work includes the operation of the Landsat series of Earth sciences satellites. The agency, though, is facing significant budget cuts. The Trump administration proposed $922 million for USGS in 2016, 15 percent below the $1.085 billion it received in the fiscal year 2017 omnibus spending bill. The proposed budget did include a $22 million increase in ground systems development for Landsat 9, the next spacecraft in the Landsat series, to keep that work on schedule to support a 2021 launch of the spacecraft. However, it also proposed a $9 million cut in satellite operations to defer "noncritical system maintenance and hardware and software refresh" and reduce planning for a spacecraft to follow Landsat 9. If Reilly's nomination is confirmed by the Senate, the USGS will become the third major civil government agency to be led by a former astronaut. Richard Truly served as NASA administrator from May 1989 to March 1992, and Charles Bolden also led the agency from July 2009 until January 2017. Kathryn Sullivan was administrator of the National Oceanic and Atmospheric Administration from February 2013 until January 2017.